The Northern Flicker (aka Yellow-shafted Flicker or yellow hammer) are very familiar birds in areas that have a combination of trees and open areas and that includes towns and backyards. 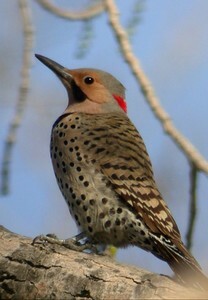 Flickers are large woodpeckers, but feed mostly by eating ants and onther insects on the ground. Most woodpeckers hunt for insect larvae under the bark of dead trees. In North America, the Northern Flicker has two forms. The "Yellow-shafted" form is found in the East (like Alabama) and the "Red-shafted" form is found in the West. These birds were separated by the Great Plains because the area had few trees except along the rivers before the areas were settled. Since then, we have changed the habitat by planting trees in towns all across the Great Plains and flickers have moved into these areas. So now, the yellow and red forms have both moved into the Great Plains states from opposite directions and these birds hybridize where they come together. Flickers excavate their own nest cavities from dead trees and provide nest cavities for many other cavity nesting birds. Flickers will also use nest boxes and sometimes make holes in the side of houses to nest. Instead of singing, they "hammer" or drum on trees, houses and telephone poles to let other flickers know the area is occupied or to attract a mate. Voice: The Contact call a high, piercing, clear keew; when flushed a soft muffled bwirr. Song a long, strong, relatively low-pitched series kwikwikwikwi... continued steadily for up to 15 seconds. Drum averages moderate to fast speed, but variable, overlapping many species. Diet: Insects, especially ants (more than any other North American bird); also occasionally seeds, acorns, nuts, and grain. Habitat: Open forests, woodlots, groves, farms, towns, semi-open country. Displays: Courtship: noisy, active, with calling, drumming, wing and tail flashing, billing, and bobbing while pair face each other. Aggressive displays include bill pointing, head swinging/bobbing, tail spreading. Nest: Prefers tree snag; will use variety of cavities: poles and posts, houses, banks, haystacks, boxes. Nest Height: Usually 6-15', up to 100'. Eggs: Averages 5-8 white eggs 1.1"
In the video, see if you can identify the males from the females because the males have a mustache. The nest appears to have at least three young because we noticed two males sticking their heads out of the nest at the same time (yes, even the young males have the mustache). The female is the one licking the bark. Notice how long her tongue is. A female also gives the "clear" call and flies out of the hole at the end of the video. Alabama has been known as the "Yellowhammer State" since the Civil War. The Alabama state bird yellowhammer nickname was applied to the Confederate soldiers from Alabama when a company of young cavalry soldiers from Huntsville, under the command of Rev. D.C. Kelly, arrived at Hopkinsville, KY, where Gen. Forrest's troops were stationed. The officers and men of the Huntsville company wore fine, new uniforms, whereas the soldiers who had long been on the battlefields were dressed in faded, worn uniforms. On the sleeves, collars and coattails of the new cavalry troop were bits of brilliant yellow cloth. As the company rode past Company A, Will Arnett cried out in greeting "Yellowhammer, Yellowhammer, flicker, flicker!" The greeting brought a roar of laughter from the men and from that moment the Huntsville soldiers were spoken of as the "yellowhammer company." The term quickly spread throughout the Confederate Army and all Alabama troops were referred to unofficially as the "Yellowhammers." A bill introduced in the 1927 legislature by Representative Thomas E. Martin, Montgomery County, was passed and approved by Governor Bibb Graves on September 6, 1927 and named the Yellowhammer as the Alabama State Bird.